The invention relates to an insufflator comprising a supply connection (22) and a delivery connection (14) and a pressure and flow measuring unit located between said connections (14, 22) for determining a gas pressure that prevails in the delivery connection and a measuring variable that characterises a volumetric gas flow in the delivery connection. The pressure and flow measuring unit comprises a multi-layer sheet (20), the interior of which contains at least one flow channel (26) that is connected to the supply connection (22) at its entry point and to the delivery connection (14) at its exit point (8). Pressure sensors (32, 34) and electronic components (4, 6) for wiring the pressure sensors are located on the sheet (20). 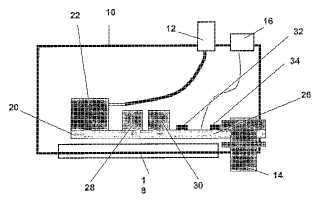 Each pressure sensor is in direct contact with the flow channel (26) via a corresponding opening in the sheet layer that otherwise tightly seals said flow channel (26) and is designed to provide an output value that represents the static pressure prevailing at each opening.